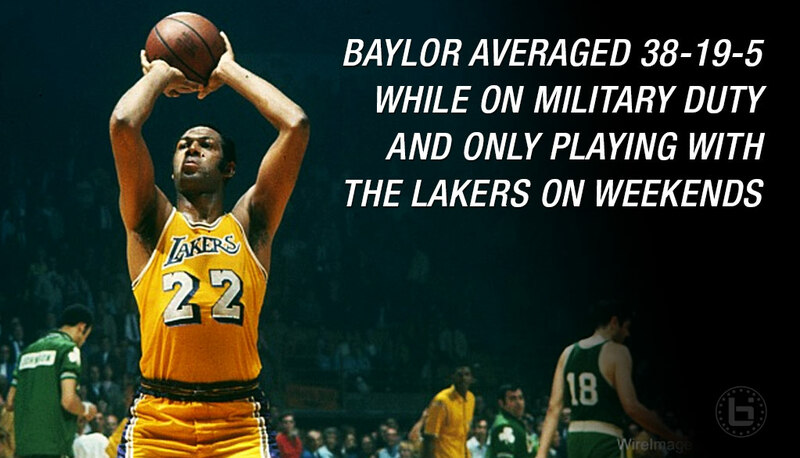 Elgin Baylor – Most Underrated Player in NBA History? One pioneer and NBA legend that seems a little unappreciated and MIA in many conversations about the greatest Lakers and small forwards ever is Elgin Baylor. Due to the lack of video of Baylor’s hoop exploits (WCA said only 2% of his career field goals exists in footage) and perception of competition during his time, it’s hard to convince people of his greatness. But, those lucky enough to have witnessed the greatness in person have no issue raving about it. Ex-teammate Jerry West also praised the former No. 1 pick and Rookie of the Year. During his prime, Baylor was averaging in the mid to high 30s per game and on November 15th of 1960, he set a then NBA record with 71 points to go along with 25 rebounds in a game. Not bad for a player who didn’t start playing basketball until he was 14-years old. The most amazing fact about the following season wasn’t what he did on the court but what he was doing off of it: Baylor was on active duty for the Army and only played with the Lakers on weekends. He was still in good enough basketball shape to average 38/19/5 and drop a NBA Finals record of 61 points to go with 22 boards! Unfortunately, that season ended with another disappointing loss to the Celtics. After many more disappointing and injury-plagued seasons, Baylor retired 9 games into the 1971 season — the season the Lakers finally won a championship. Baylor received a championship ring, but it was a bittersweet gift as he wasn’t able to play for it. In 1977, the player who made the All-NBA 1st team in 10 of his first 11 seasons was inducted into the Hall of Fame and in 1996 was honored as one of the NBA’s Top 50. Two decades later, I feel he’s one of the most underrated and unappreciated basketball players and athletes ever. Hopefully, rare posts like this will help people remember or learn more about him and why their favorite players had so much respect for him.